I have once again been roaming around looking through Pinterest. Where there is a never ending collection of wonderful kitchen things, to look at. 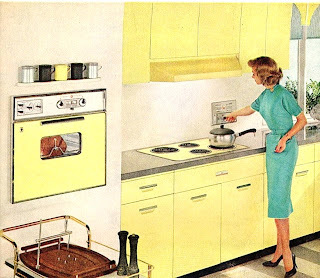 Today, I was looking at vintage advertisements of kitchens. Beautiful color kitchens. 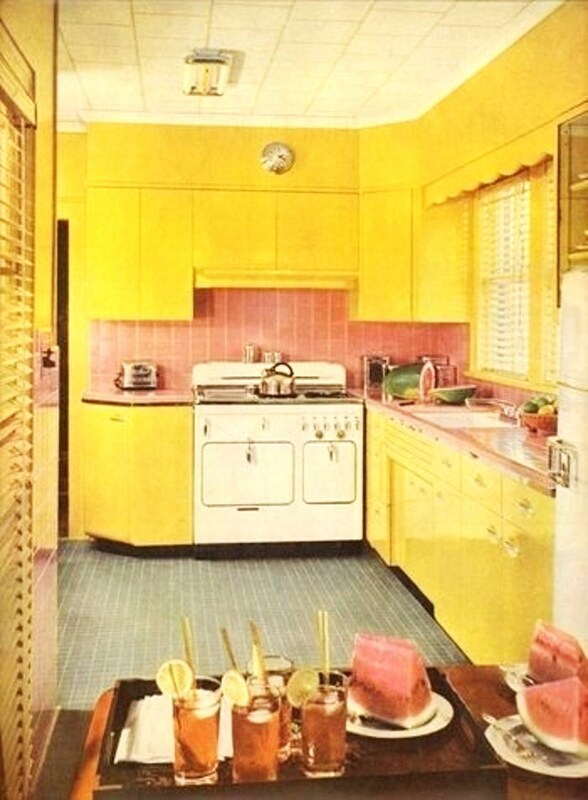 So these are the pictures of the kitchens, where yellow came to live. 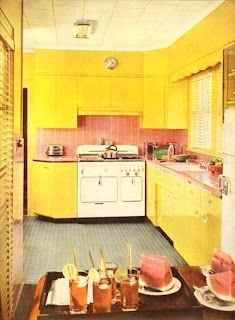 I was so taken with the use of those pink tile counter tops... with the bold yellow steel cabinets. And that looks like a pale green tile floor too. 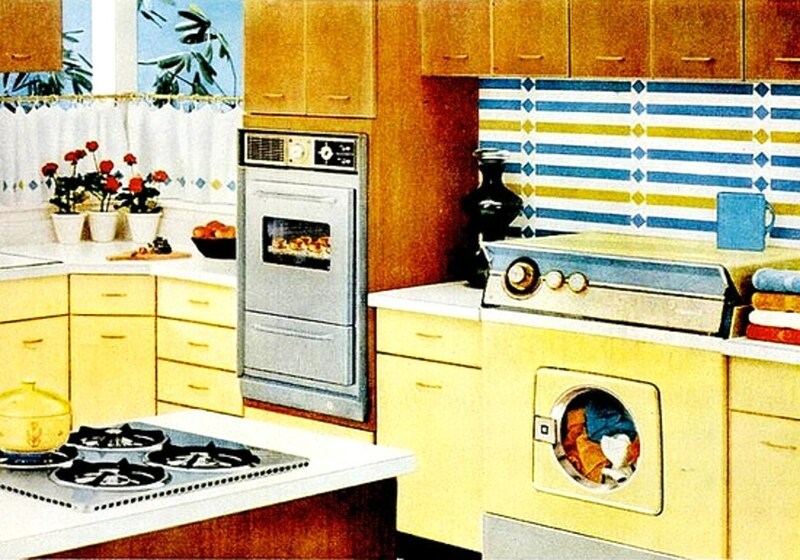 I am curious when placing the washer, was in vogue for the kitchen of proper ladies. Things like that always interest me. Because the last thing I would have in the center of my kitchen, would be the washer. It is one thing to have your laundry room next to the kitchen. But dead center of the room? Nope. I have always loved those old tile floors. Where they have a detail pattern in them. This one being yellow... with the green line detail. I wonder if this was really those peel and stick squares. Versus being ceramic tile. 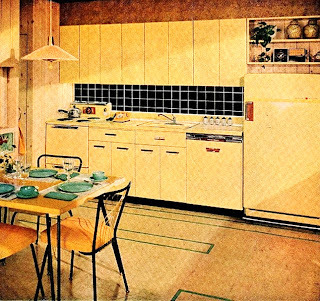 Here is more use of the yellow steel cabinets. 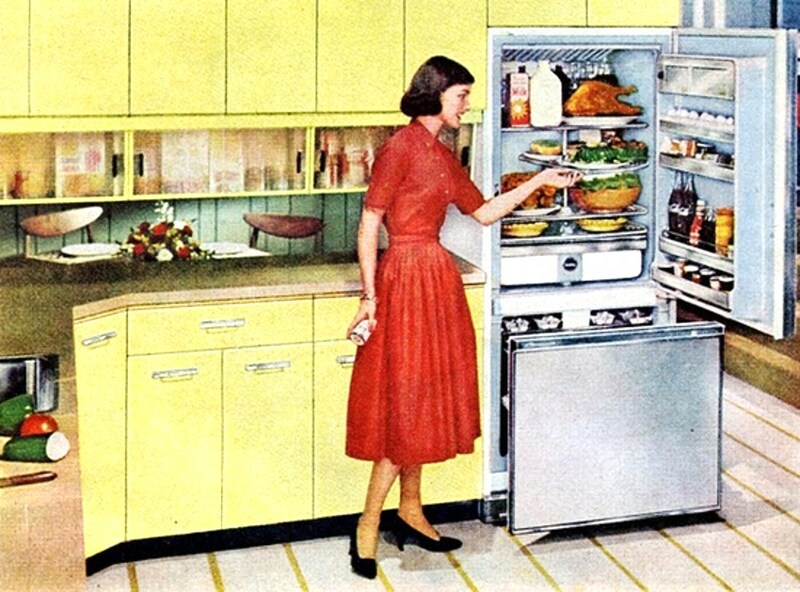 With a refrigerator that looks suspiciously like the new ones on the market now. Maybe I will get lucky and having pretty colorful kitchen appliances... will make a come back too! The washer in the middle of the kitchen is quite weird! 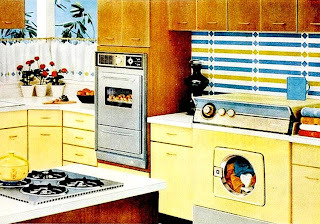 I see there is folded clothes off to the side, in kitchens like these was the dryer in there, too? I love vintage kitchens, so much more fun. So boring nowadays. At this time I suspect clothes were still being hung out side to line dry. A dryer would have been a true luxury. But not unheard of especially if you could afford this nice of home. 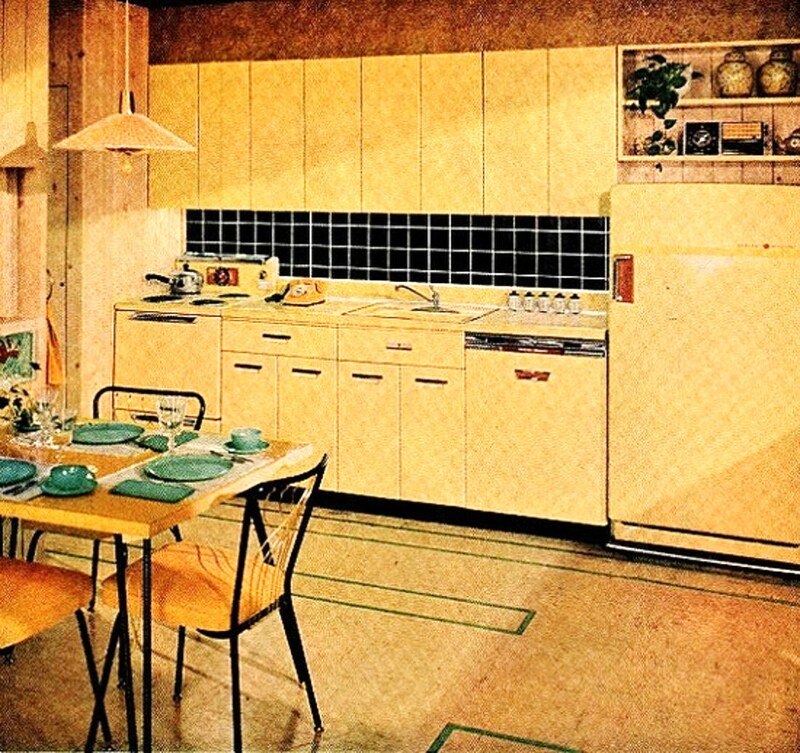 I have toured enough homes in my town to know, this was common in those wonderful 1950's mid century homes. The washer and dryer sitting smack dab in the center of the kitchen.